but night worthy of star gazing away. you might start star-watching earlier on. some clear wintery night you come upon. totally transfixed, in a star struck haze. guard Mother Nature’s treasures for all eyes. Next I’m sharing Matt Forrest Esenwine’s wonderful book, FLASHLIGHT NIGHT, that I won from his website recently. His book’s about a magical adventure three children take in the evening via a “flashlight.” The story Matt wove and the art images by Fred Koehler are a perfect marriage in this picture book. If you haven’t read it I would encourage you to find a copy–it sweeps you up and draws you in throughout their journey–resting you quietly down as the children drift off to sleep. One of the many sites the three children discover… I really like the contrast and play of light that Fred created when the flashlight illuminates an area. Thanks Matt for writing this mysterious and enchanting “FLASHLIGHT NIGHT” adventure! I’m also sharing my lovely winter poetry swap poem and gifts that I received from Buffy Silverman. In addition to the poem and gorgeous image, Buffy also sent me this Karner Blue Butterfly which her daughter knitted, and that she found on my website. The Karner Blue in addition to be gorgeous is unfortunately endangered, and for this reason I like to share it so more will become aware of its plight. Thanks for the poem and gifts, Buffy! Sending a Thank you also to Tabatha Yeatts who began and organizes this special holiday poetry swap! Serendipitously, Buffy Silverman is hosting this weeks Poetry Friday Roundup at her Blog, Buffy’s Blog–thanks for hosting Buffy, I’m looking forward to viewing what you are sharing. This entry was posted in Children's Illustration & Writing, Holidays, Nature, Painting, Pencil Drawing, Plein Air Art, Poem, Quick Sketches, Sketchbooks, Writing and tagged "Flashlight Night", #PoetryFriday, Art, artists, books, Buffy Silverman, Children, earth, environment, family, friends, Halo, Humanity, Kidlit, Matt Forrest Esenwine, Michelle Kogan, mother nature, nature, Painting, people, photography, photos, picture books, poems, poetry, Reading, reflections, spirit, Star gazing, stars, stories, travel, Waiting, wings, Winter Solstice, Women, Writing. Bookmark the permalink. Glad you’ve been star gazing in the dark nights of December! Thanks for these treasures and for sharing my poem, Michelle. “poem, painting, jewel”, so beautiful for you and from Buffy, Michelle. I do love, too, your “remember your winter solstice ally” & the painting ‘peace’. Happy Solstice! Thanks Linda–yes Buffy hit it on the spot! Happy Solstice and Merry Christmas to you and your Family, Enjoy! I could imagine your artwork painted onto a window, Michelle – sans black paint, relying on the inky sky. Loved the line, ‘When you’ve stair-stepped down from the boundless sky,’ – though confess I first read it as ‘star-stepped’… which I think adds to the appeal of stair-stepped, for me. 🙂 And lovely collection from Buffy. (That leaf shape poem, bookmark, too!) Thinking of you across oceans of sky and wishing you a blessed Christmas. What beautiful poems, Michelle – yours is reflective and thoughtful, Buffy’s is full of imagery and emotion! 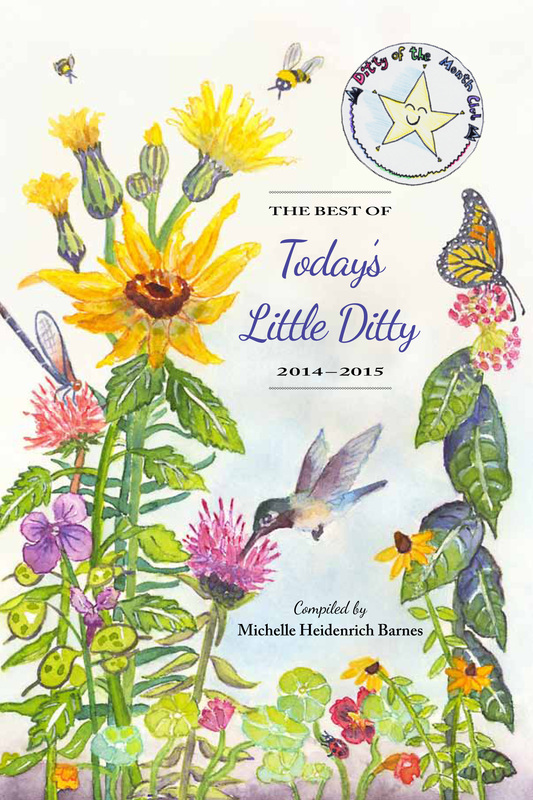 (On a side note, the Karner Blue is our official state butterfly here in NH) Thank you also for featuring our little book…I’m so glad you enjoyed it enough to share ti with your readers! Your collection of solstice-treasures is leaving me starry-eyed, Michelle! I am not surprised by y’all’s talents, but I didn’t know that Buffy’s daughter can knit butterflies — how cool is that?! Without a pattern, Tabatha! Don’t know how she does it. What a rich post of treasures. Starlight, sunlight and flashlight. Thanks for shining some light with your words and art, Michelle! Your painting of the night sky is absolutely gorgeous! I love the scale of the big darkness and the word peace. Thank you! Buffy captured you perfectly in that poem! I wish I could give the gift of of rural darkness to all the urban kids in the world who have no idea what it’s like to look up into pure black and see a sky FILLED with stars, including the Milky Way. Oh my, such an abundance of wonder here, Michelle! Thank you for sharing all of it. I love your solstice poem and painting. I haven’t heard of the book, but I will track it down. I remember having adventures by flashlight when I was a kid. And your poetry swap poem is delightful, too–it looks like a lot of fun! You are a star-gazer and a plein-air poet. Beautiful gifts of the season. Goodness, the richness of all this! Thank you for taking the time to share! but night worthy of star gazing away.” And that butterfly! I’m a knitter and I’m going to look for that pattern. Thanks Laura, have fun with the butterfly and maybe display her somewhere so more will become familiar with her plight.